A water damaged ceiling, comes in all different shapes, colors, and sizes. What you need to know first, is before you can repair the ceiling, you MUST locate and repair the issue causing the water damage in the first place. A huge mistake most people make is trying to patch the water damaged ceiling themselves without figuring out the root of the problem beforehand. Without identifying the source of the water damage, the issue will keep reoccurring and you’ll end up with water damaged ceiling once again and potentially even other issues. For example, homes with a crawl space or basement may experience flooding or some type of water damage that is left unattended for long periods of time. When water is left unattended it becomes, “standing water” and after a while it creates humidity which can weaken the home structure and also affect the air you breathe. The moisture makes its way into the walls, the flooring, the ceiling, and even the kitchen cabinets. After so long, these materials are affected by the humidity and end up collapsing. Imagine repairing your water damaged ceiling and a few weeks later, it ends up collapsing or is overrun with major mold growth. This is exactly why water damage cannot be ignored and immediate action is crucial. It’s important for property owners to be able to identify water damage because the signs are sometimes unnoticed or neglected. Water can be underestimated in its ability to cause major damage even by the smallest of leaks. If you haven’t noticed any obvious water damage like leaky hoses or pipes, then it’s always a good idea to check areas with the most potential for water damage. When it comes to a water damaged ceiling, there are pretty clear signs that indicate water damage. 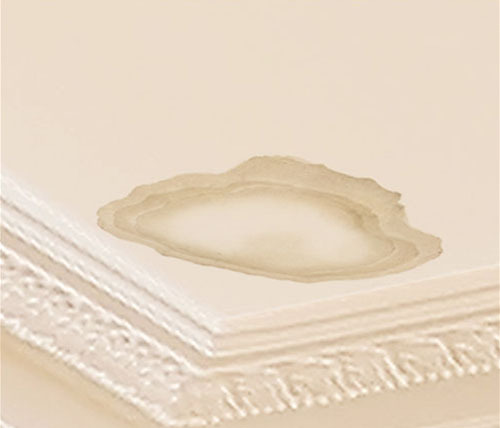 A water stain is one of the most obvious of indicators for a water damaged ceiling. Normally these stains look “rusty” or a “brownish” color. Water stains can either suggest an ongoing leak or a previous leak. Either way, it’s always best to take the safe route and find the source of the problem so you don’t end up in a bad financial situation from costly repair bills. There are many conditions that could create water stains. Roof leaking from heavy rains, toilet overflowing from upstairs bathroom, pipes leaking, and condensation line leaking are a few causes. Another sign of a water damaged ceiling is “swelling” or “bubbling”. When the ceiling looks like it is bulging out, it means there is an accumulation of moisture into the wood and drywall. This can be dangerous at times because if the water continually collects, the ceiling can collapse in that specific area. Some situations are as easy as poking a hole in the bubbled area and releasing excess water into a bucket on the ground. In these situations, it’s a good idea to contact a professional because finding the source of the problem and fixing it correctly will save you time and money. Also, there may be more water than expected and it could be a dangerous situation. 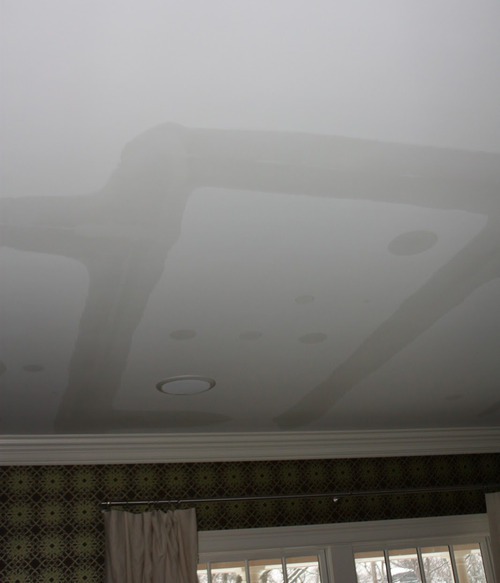 A water damaged ceiling can sometimes look like it’s “sweating”. 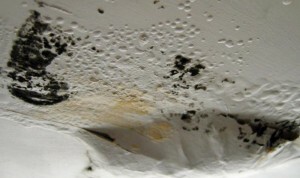 The discoloration usually looks a little darker than the paint and presents itself during the beginning of a water leak. The excess moisture or humidity will creep into the ceiling and walls and will then turn into water stains, bubbling, etc. When sweating occurs, it’s a clear sign that you need to take action immediately before the problem worsens. Usually this type of water damage is associated with the HVAC system. Some water damage signs may be unclear, but mold growth is a clear indicator there is water damage. Mold is very dangerous for people and needs to be handled as urgently as possible by an experienced mold remediation specialist. Mold can start growing within 48 hours and if moisture is continually present, mold spores can be released and attach onto another areas of a home. On a water damaged ceiling, mold can latch onto any surface with the right amount of moisture and humidity. If you notice an area that may be growing mold, do not wait to fix the source of the problem as mold can cause health issues and even death for some individuals.These water damage signs can help you identify the source of the problem and fix it before the water travels and creates a disaster. First and foremost, locating the source that is causing the water damaged ceiling is the most important step to take. There is no point in repairing drywall or paint if the issue continues. 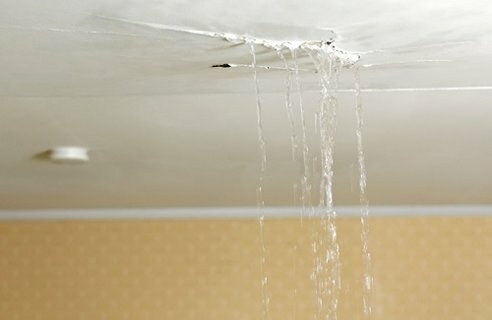 The most common causes for a water damaged ceiling are leaky pipes, leaky condensation lines, and roof leaks. Oftentimes, it can be hard to determine the source of the problem without hiring a professional, but eliminating potential causes can help. For example, if the water damage occurred right after a heavy rain storm, it’s most likely a roof problem. In other situations, like during the hot months, an air conditioners’ condensation line may leak and cause moisture in the ceiling. After eliminating several possibilities, it may lead you to a plumbing issue as the cause. From there, having an expert come in and inspect the problem may save time and prevent any other issues. If you decide to perform the inspection, make sure to shut off all electricity and water to prevent any safety issues. After identifying the source of the water damaged ceiling and fixing the problem, steps can be taken to repair the drywall yourself. After the water source has been dissolved, there is still an issue concerning the wet ceiling and drywall. Remove the wet and damaged materials like drywall or plaster. Any portions that are hanging or bulging can be easily cut or scraped away with the right tools. Also, check for any soft wood that could have been affected by the water. Removing these materials quickly can help prevent mold growth. In order for mold to grow, moisture needs to be present and that’s why the entire area needs to be thoroughly dried out. Most of us do not acquire the appropriate equipment to dry these areas out and even if you do your best, it’s hard to fully know that there is 0% moisture. Hiring a water removal specialist could put your mind at ease because they have advanced drying equipment and the tools to test for moisture. Although, if you feel comfortable drying the area yourself, it’s best to place fans above the ceiling and below to have a top down dry out. The number of fans depends on the extent of damage. A water damaged ceiling needs a lot of air circulation and very low humidity in the household to fully dry out. Just make sure to inspect the area for mold growth because you could end up doing all the work for nothing. Plus, if mold was present while drying out the area, the spores will be released by the air flow and drift into other areas, creating a very dangerous home for humans. Next, is preparing the ceiling surface. The ceiling is the most difficult area to repair because of the installation of plaster or drywall. It may take a couple times to get it just right. If the water damaged ceiling suffered severely and you had to take out wood or insulation, you must replace these items before repairing the damage. Afterwards, you must sand the damaged area. Make sure to sand out any bumps or any areas that are not flush with the rest of the ceiling. Apply drywall to fill in the missing holes or cracks once you are finished sanding. Now you can sand the area once again and it’s ready to prime and paint. If there are any leftover stains, it’s best to apply a coat of stain-blocking primer, let it dry, and then one more coat of primer. After drying, you can begin your painting. For the best look, paint the entire ceiling so it looks uniform. Hopefully these tips can help you if you have a water damaged ceiling. Water damage can truly be a devastating experience and here at Connected Restoration, we are here to help every step of the way. 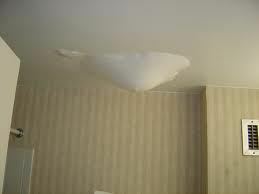 If you do experience water damage on your ceiling or any area on your property, please do not hesitate to call us. 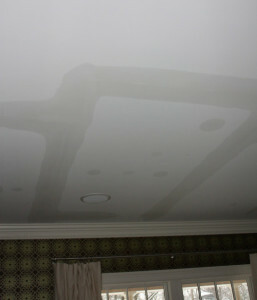 Sometimes dealing with water damage can be frustrating and leaving it to the professional can eliminate some stress. Check back to our blog for educational material relating to water damage.